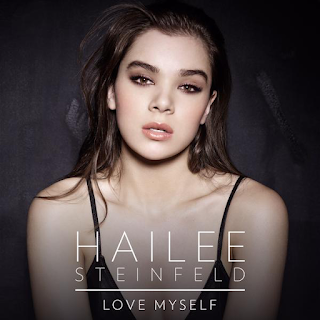 SnapCacklePop: Hailee Steinfeld delivers pop perfection..! Hailee Steinfeld delivers pop perfection..! Fan of or Taylor Swift Bad Blood video or Pitch Perfect 2 might recognise Hailee Seinfeld as singer who sang Jessie J's Flashlight in the movie and had a cameo in Tay Tay video. They are friends. after all . Well now she is becoming a pop star on her own, releasing new music and its basically pop brilliance. Stepping out on her own she have release new single Love Myself that is produced by Mattman & Robin, who’ve worked with Taylor Swift, Tove Lo and Carly Rae Jepsen. It's uplifting, charging anthem that is slightly Icona Pop, but with more pop dust and its fast becoming a SCP fav track already. Don't believe us, press play below, then go get your copy on iTunes straight away..!